Vegan Ham Roast (homemade seitan) - perfect for the holidays! This vegan ham, you guys. It’s the kind of recipe that really gets me excited. Because it reminds me – yet again – that ANYTHING can be veganized. That no animal needs to be harmed for us to enjoy every smoky, meaty, cheesy, baconey, whatever, taste we have ever enjoyed. To me, this recipe is EMPOWERING. It reminds me we can still participate in our holiday traditions but align them to our evolving sense of ethics. And moreso, that we can prove these points to our loved ones in the form of deliciously tender pineapple-and-mustard-glazed vegan ham. In fact, this vegan ham was the centerpiece of the holiday roast kits we offered to our seasonal catering clients this past Christmas, and it was a huge hit – with both their families AND ours! Side note: We served it with our vegan au gratin potatoes which we highly suggest if you’re looking for a killer side dish to pair with this roast! This vegan ham recipe is made with seitan and flavored with liquid smoke, maple syrup, and a pineapple mustard glaze. The pink color – from the beet juice – makes this roast the perfect dish to bring to a holiday gathering when you want to really impress! It takes a fair amount of time, but most of that is cooking time, and I can tell you from personal experience, it is SO worth it. This vegan ham is A-MAZING fried up in a skillet the next morning for breakfast. Pair it with a tofu scramble and homefries OR make a killer vegan breakfast sandwich. You can even throw it in a tofu quiche or make vegan ham & cheddar hot pockets…ohhhhh, the possibilities! And when you make this recipe, let us know! Rate the recipe and leave a comment below or tag @theplantpowercouple on Instagram. We’d LOVE to see your drool-worthy food photos and hear allll about how awesome it was! This vegan ham recipe is made with seitan and flavored with liquid smoke, maple syrup, and a pineapple mustard glaze. The pink color - from the beet puree - makes this roast the perfect dish to bring to a holiday gathering when you want to really impress! It takes a fair amount of time, but most of that is cooking time, and I can tell you from personal experience, it is SO worth it. In a large mixing bowl, combine the dry ingredients with a whisk. Create a well in the center of your mixture and pour in the wet ingredients. Stir with a big wooden spoon until a dough starts to form. Then, get in there with your hands and knead for about 2 minutes. Next, use your hands to form a round loaf with the dough. Wrap this loaf tightly in tin foil, and place in the steamer with the seam down for 45 minutes. When the steaming is almost done, preheat your oven to 350F and grab a baking sheet. Carefully remove the roast from the steamer, flip it upside down, and place it on the baking sheet. Open the foil a bit at the top to give the steam a place to escape and place in the oven for 20 minutes. While the roast bakes, make your glaze by mixing all the ingredients together in a measuring cup with a fork until the sugar is dissolved and everything is well-combined. Grease a small baking dish and when the timer goes off, carefully remove the roast from the tin foil, flip it upside-down, and place it in the baking dish. Pour 1/2 the glaze over the ham, use a knife to slice 3 not-too-deep cuts into the top of the ham (optional) and bake, uncovered, for 30 more minutes. Remove the ham from the oven once more, pour the remaining 1/2 glaze over it, and allow it to cool for about 10-15 minutes before slicing. Enjoy! *You'll have excess beet puree which can be used in smoothies and soups! You can make this roast a day or two ahead of time. Just reheat, wrapped in foil, in the oven at 300F for 20 minutes. Leftovers freeze well for up to a month. This vegan ham is A-MAZING fried up in a skillet the next morning for breakfast. Pair it with a tofu scramble and homefries OR make a killer vegan breakfast sandwich. You can even throw it in a tofu quiche or make vegan ham & cheddar hot pockets...ohhhhh, the possibilities! This recipe has been updated as of 12/15/2018 but first appeared on Plant Power Couple in August 2017. 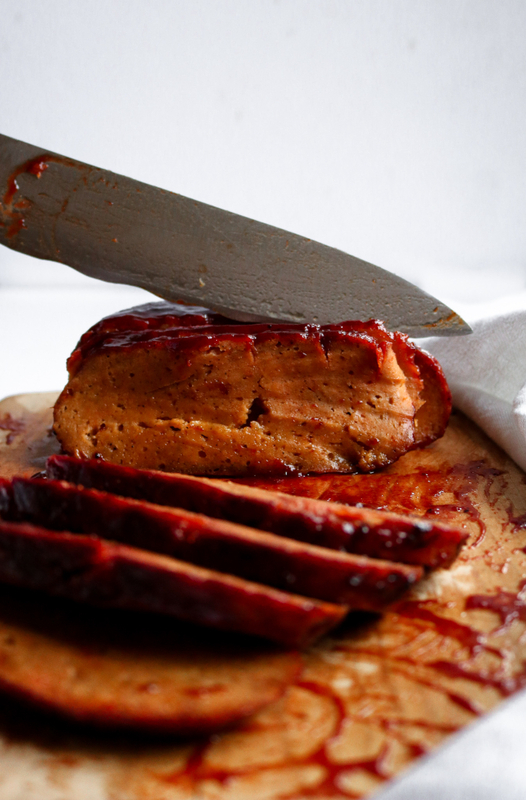 Our recipe is an adaptation of the Candied Vegan Ham recipe by Chubby Vegan Mom. Her methods are a little different, such as using a crock pot rather than a steamer. If you’d rather cook this in a crock pot, we highly recommend taking a look at her recipe. The only thing I’d change is adding a little beet juice to the crock pot for color. And speaking of equipment, we use this electric steamer to make most of our seitan recipes. If you’re working with limited counter space (we hear ya there! ), these bamboo steamers can also be a great option! Of course, you can use whatever steaming basket you have on hand; even a colander placed over a large pot of boiling water and covered works! Hello- beet juice- how is this made please? I've never seen it for sale where I am. Hey, Karen! We just buy canned beets and use either the water from the can or blend a few beet chunks with water. You can do this with fresh beets too! Could you use parchment paper first to wrap and then foil ? I do not care to have foil touch the food I am going to eat. Hey, Barbara! You can use cheesecloth or a nut milk bag to wrap the seitan if need be. Mary's Test Kitchen on YouTube has a couple seitan recipes made like this: https://www.youtube.com/watch?v=TJOvTkZSPS4 (1:45 is where she explains the cheesecloth method). I used the exact same amount of ingredients as in the recipe but our seitan ham came out a very dark red rather than the light brown in your picture. It just looks wrong! I followed the recipe word for word too! Any idea why? Hey, Adam! The beet juice you used could have been more concentrated than you'd like which produced a darker color. I'd recommend either watering down the beet juice or replacing it with vegetable broth! We have made this twice now and it has turned out very chewy. Any ideas why? My husband is allergic to coconut. What would you recommend using instead of the coconut sugar and coconut oil? I would like to try making this recipe the day before a holiday and reheating it the day of. Would you suggest steaming it and then waiting to bake it till the next day or will it be fine to just reheat the finished product? I am worried about it drying out if i bake it twice. Thanks! Hi here. Super excited to try this recipe for thanksgiving. I’m wondering what kind of steamer you use... would a instapot work? And if that’s different then what you use should I change the amount of time is use? Thanks, happy holidays vegan friends! Hey, Christine! So sorry to be getting back to this comment so late. Did you try it in the Instant Pot?! I know we've made it in the crock pot before but don't have an IP (yet! lol). If you gave it a try, let us know how it went. Hope your holidays were awesome! I must make this! 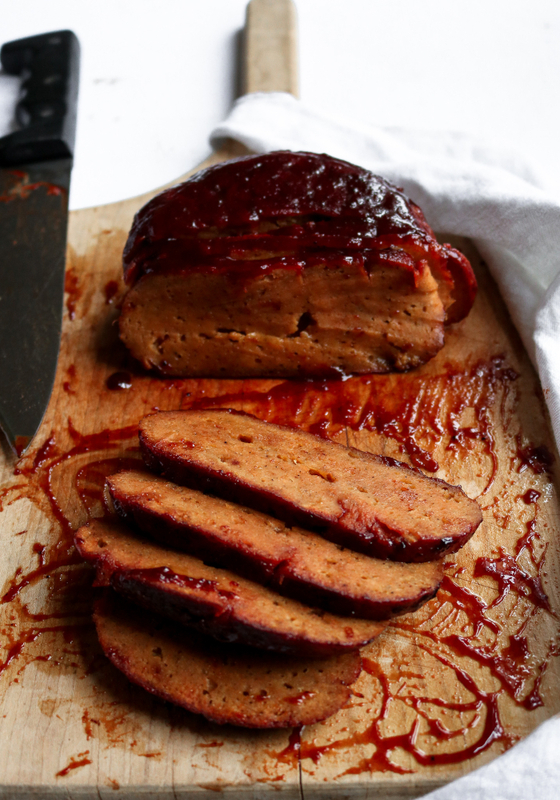 I have a pressure-cooked seitan recipe that could use this glaze! any advise on how this can be done in an electric pressure cooker? Hey, Michelle! Unfortunately, I don't know too much about electric pressure cookers. We have made it in a crock pot though. Let us know if you give it a try! Did not like this at all. The seitan was a mess to work with, so stringy and it wanted to turn to lumps. We felt like we were eating gristle loaf. I changed the recipe by adding 1 1/2 cup of cooked white beans blended with the liquid (liquid must be 1 1/2 cup total) at the beginning, then added the nutri. yeast, spices, and flavorings. Last I added the gluten and mixed. It was much better. Hey, Candace! So sorry you had trouble with the recipe at first but super glad you found a way to make it work for you! Rock on! I'm using this as base for my "White Trash Ham" (Ham in coke) this year for our traditional pre Xmas meal ... I replaced the Beet juice with Coke and Beet Powder and made 3 x Qty ... it's great, thank you! Wow, this is genius! Thanks for the idea, definitely giving this one a try! Can I bake it in the oven and not steam it? Hi, Syuzanna! We suggest steaming the roast for 45 minutes, flipping it once halfway through. Have you tried “poach” this in a favour bath either in the oven or on the stovetop instead of steaming - like with the chickind (that’s what I call my seitan chickn) seitan recipes? Hi, Amanda! 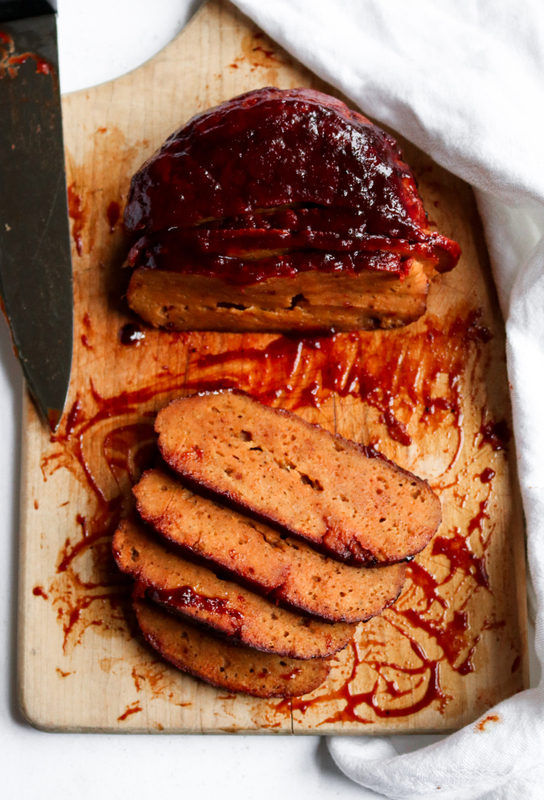 We haven't thought of poaching the seitan, but that could be a great idea! We did just recently post a corned beef seitan made in the slow cooker, maybe that's more the method you're looking for? If you click on Recipes in the menu section above, it will be the on the first page! Hi, Heather! I'm so sorry to hear you got a mushy seitan ham! :( Seitan texture can be tricky sometimes, especially depending on where you live and what the weather is like. High humidity tends to require more dry ingredients to be used in the dough. If you give it a go again, just remember to feel the dough before wrapping and steaming. If it feels super squishy and falling apart, knead in a bit more wheat gluten (a little at a time). Keep in mind though, you don't want it to be overly dry / stiff. Smooth and stretchy is perfection! Hello! Could I replace blackstrap molasses with just molasses? Thank you! I made this recipe for Thanksgiving and it was delicious! It did come out a little tough though. I don't have a steamer so i used my instant pot and steamed it for the recommended time. I am wondering if maybe it should have been steamed for a shorter period of time possibly? I also cooked it in a friend's oven where i have found i have to cook things for a lesser amount of time than my own oven so maybe that could have been what made it a little tough. Any thoughts? Thanks in advance. Hi, Kathryn! I'm happy you enjoyed the recipe but sorry to hear the texture was a bit off. Subsequently to posting this recipe, we have been having a lot of luck replacing the nutritional yeast with some all-purpose flour. It helps to break that "tough" texture down even more. As for the oven, that could definitely be a factor so I'd also try roasting it a little less! We also have this seitan recipe that uses a crock pot and a "low and slow" roasting technique. It may be helpful to look that one over for an alternate cooking method. I hope this helps! Hi, Francesca! The flavor is a balance of smoky / salty / sweet, like you would find in a pineapple-glazed ham or hickory-smoked bacon. Because many asked, and I was curious, I decided to steam my seitan in my electric pressure cooker (I used the Crockpot Express, but an Insta Pot would work too). First, I set up my pressure cooker by adding about 2 cups to the bottom of the pot and then placed my metal rack (came with my cooker) in the bottom. The water should not cover the metal rack but come to just below it. I wrapped my loaf in aluminum foil, as directed, and placed it on the rack inside the pressure cooker. Put the lid on it, set the release valve to close, and put it on the steam setting for 20 minutes. When it was done, I allowed the steam to release naturally. It turned out perfect, and it's ready for baking tomorrow. Hope this helps someone. SO helpful. Can't wait to try it with our new pressure cooker. Thanks, Marie!